Black Bean & Quinoa Stuffed Bell Peppers are super filling and ultra nutritious. 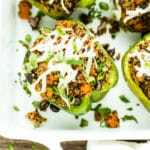 These vegan stuffed peppers are also dairy-free, gluten-free, soy-free and make a quick & easy dinner or lunch recipe! My entire 29 years of existence I have always deemed myself a meat eater. Even a salad was never complete without at least 4 ounces of chicken on top. Lately, however, I have begun to realize there are other sources of protein that can appease my inner protein-craving self. 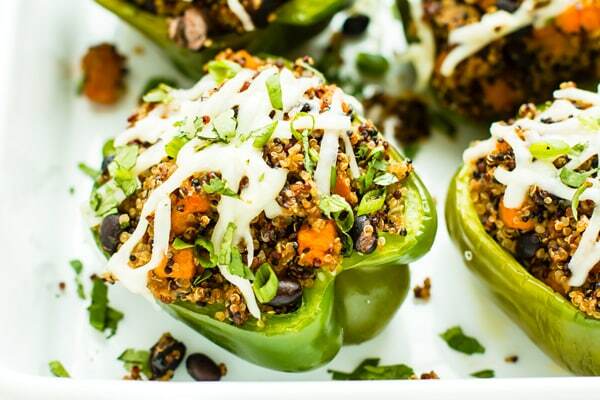 For example, these black bean & quinoa stuffed bell peppers are loaded with protein. The majority of that protein comes from the quinoa and the black beans. What’s so Great About Quinoa in these Gluten-Free Stuffed Bell Peppers? 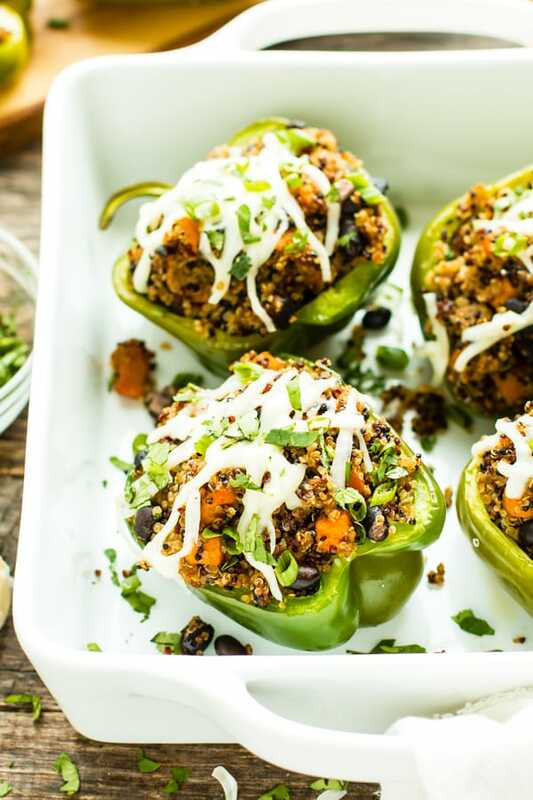 These black bean and quinoa stuffed peppers are so awesome because of one huge reason… quinoa is a “complete protein” and contains over 8 grams of protein/cup. A complete protein is a food that contains all 9 essential amino acids in adequate proportions. While there is still debate about whether or not you need to eat “incomplete proteins” with complimentary “incomplete proteins” (i.e. rice & beans), I like to make sure my body is absorbing all of the possible protein I can get! These gluten-free stuffed bell peppers seriously get better with time! After sitting in our refrigerator for a few days I remembered that we still had a couple left. I reheated one of the bell pepper halves and was delighted to discover they actually tasted BETTER than when they were first made. So if you have patience, push a couple of these quinoa stuffed bell peppers to the back of the refrigerator and wait a couple of days. Trust me, it’s worth it! 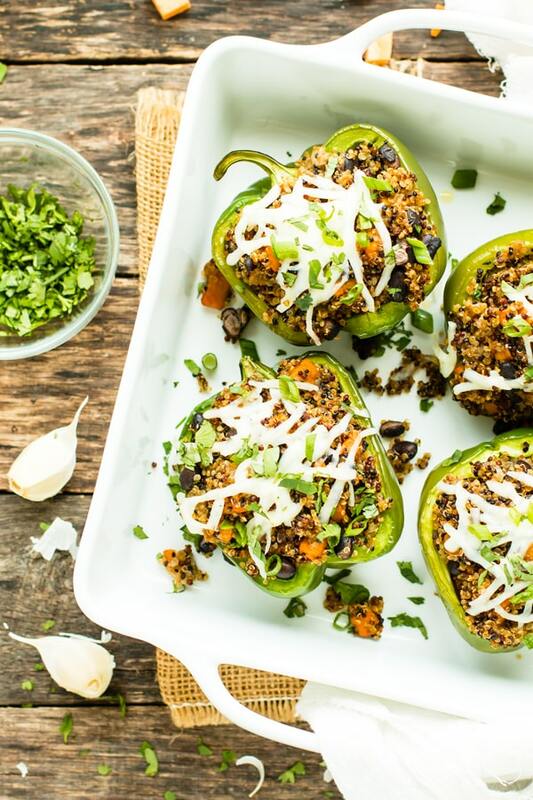 How Can You Evolve These Black Bean & Quinoa Stuffed Bell Peppers? Adding more vegetables! Feel free to add some broccoli or cauliflower to the mix. Using organic broth, or even making your own. Leaving off the dairy-free cheese to reduce the fat content. 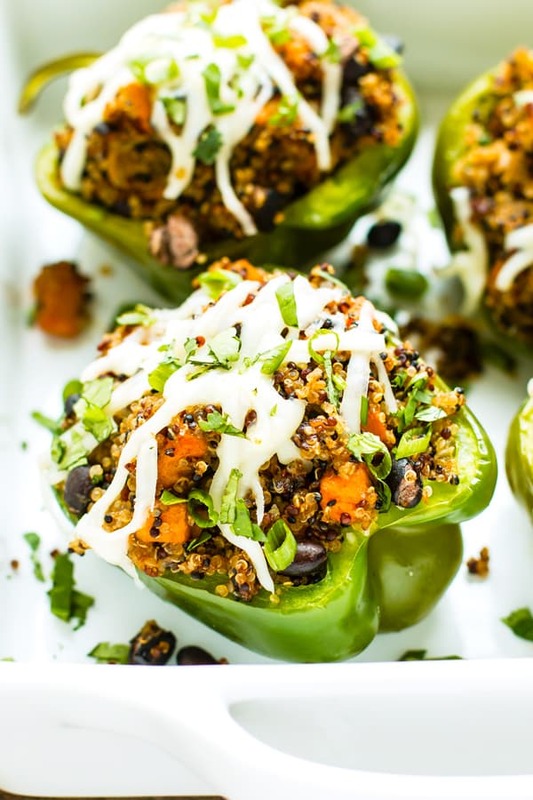 Black Bean & Quinoa Stuffed Bell Peppers are super filling and ultra nutritious. They're dairy-free, vegan, vegetarian, gluten-free, soy-free and make a quick & easy dinner or lunch recipe! Drizzle the inside of each bell pepper half with olive oil and sprinkle with salt. Place bell pepper halves cut side down into a large baking dish. In a medium-sized pot saute 1 tablespoon olive oil, onions, and garlic over medium for 3-4 minutes. Add broth, turn heat to high and bring to a boil. Next, add quinoa and sweet potatoes to the pot. Bring ingredients to a boil, cover with a lid, and reduce heat to low. Let simmer for 15-20 minutes, or until quinoa is cooked. Once quinoa and sweet potatoes are cooked, add black beans, cumin, paprika, salt, pepper, and cayenne pepper. Toss to combine. Flip bell pepper halves over and fill each half with equal amounts of the quinoa mixture. Top each half with 2 tablespoons dairy-free cheese and return peppers to the oven for 10-15 minutes. Serve with fresh cilantro and enjoy. 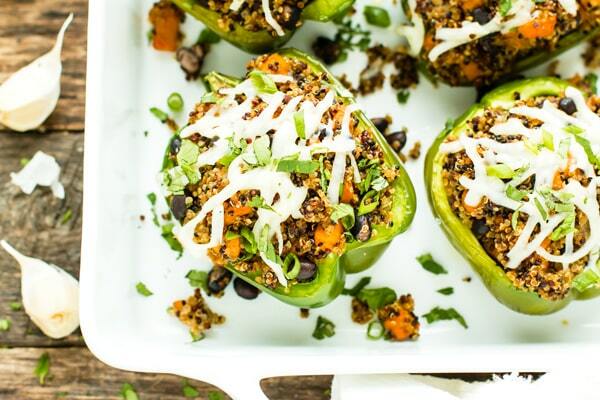 Want more recipes like these Black Bean & Quinoa Stuffed Bell Peppers? Quinoa and beans are always super filling to me. 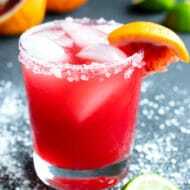 This recipe will be made very soon in our house! They TOTALLY are so filling! This recipe should keep you full until lunchtime, Bianca!